With Taylor Kitsch, Lynn Collins and Samantha Morton. Burroughs’. Original Release: Disney Pictures, March 2012. ‘One-Hundred Years In The Making’ claims the bonus DVD making-of feature. And that’s part of the problem. Watching this epic movie you could be forgiven for thinking yes, ‘Star Wars’, and yes, ‘Flash Gordon’. Which is, in actuality, a total reversal of the true situation. Edgar Rice Burroughs’ ‘A Princess Of Mars’, the 1912 novel that introduced both worlds to John Carter, was immediately much-imitated. 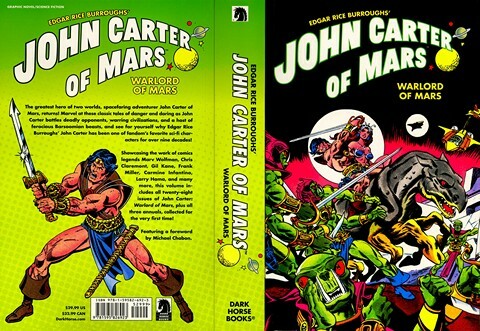 Generations of SF-writers have drawn on his vision of flashing-swords and derring-do heroics beneath the two moons of dying Mars, from Otis Adelbert Kline through Leigh Brackett and John Norman all the way to Michael Moorcock. 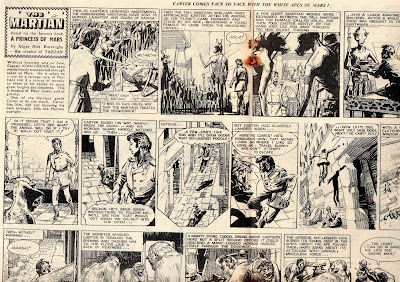 Alex Raymond’s vivid ‘Flash Gordon’ series set on the planet Mongo – launched as a King Features newspaper-strip in 1934 is certainly part of that tradition. While when George Lucas was storyboarding the first installments of the ‘Star Wars’ cycle he had the movie-matinee ‘Flash Gordon’ cinema-serials vey much in mind, with the intention of recreating his own sense of adolescent wonder, with the added benefit of improved special-effects. 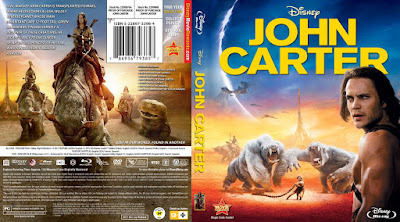 So that by the time we get to Disney’s much-hyped ‘John Carter’ (2012), much of it already seems, by default, like overdone swords-and-sorcery cliché caught in a diminishing echo. There’s an argument that – like Peter Jackson’s ‘Lord Of The Rings’ movie-trilogy, it was not technically possible to do justice to the wide-screen vision of ‘A Princess Of Mars’ before the advent of computer-generated imagery. 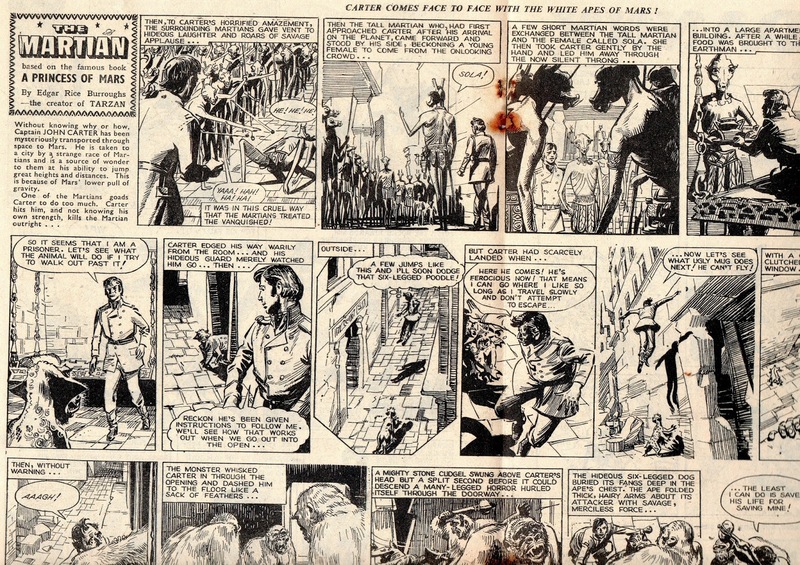 It could, and has been, portrayed in garish magazine-art, astounding comic-strips and comic-book editions where artists were limited only by the constraints of their imagination and skill. During the 1930’s Warner Brothers animator Bob Clampett drew test-footage, which still survives, but the project was dropped largely because ERB’s bestiary of extravagant Martian creatures seemed impossible to represent on screen. How to film six-armed Tharks or the giant Thoat mounts they ride, and give them any semblance of life? How to convincingly animate the ten-legged Banths, Apts and huge ferocious White Apes? TV Sci-Fi and Creature-Feature Drive-In Shockers have always used prosthetics and strings, miniaturisations and puppetry to achieve their shoddy ends. Film-makers such as Jon Favreau and Guillermo Del Toro toyed with the idea of using such techniques, while John ‘Jim’ Morris – working with director John McTiernan during the pre-digital late-eighties, got as far as casting Tom Cruise in the ‘John Carter’ role. But they always stopped short of visualising Barsoom. Until now. The Disney tagline promises ‘Movies, Magic and More’. Whether it delivers for John Carter is still very much open to debate. Burroughs was not a sophisticated writer. The making-of feature uses rare recordings of Burroughs’ own voice to narrate his life-story. About how, with his career in what scripter Michael Chabon describes as a state of ‘desperate existential despair’, he began ‘slumming-it for a pay-cheque’ (Jon Favreau). Reading a selection of pulp magazines he decides ‘I was sure I could write stories just as rotten as theirs.’ But when he did, he hit an immensely lucrative mythological nerve. So would he have enjoyed this movie? My guess is that he would. 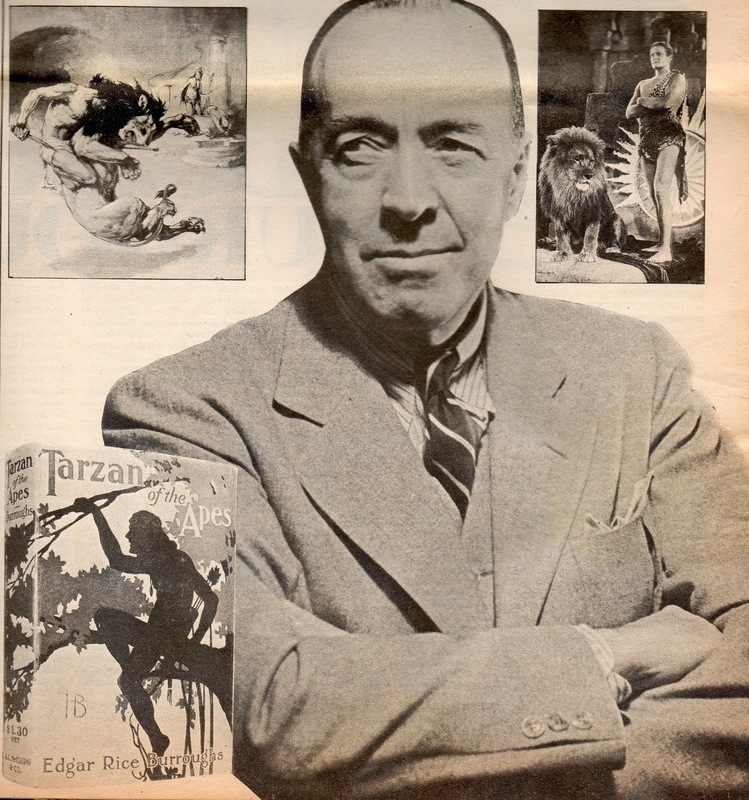 He was quick to license Tarzan for all manner of multiplatform projects, from comic-strips to films, and was equally happy for production crews to inflict their own interpretations onto his creations, no matter how outrageously preposterous. Writing at a time when readerships were less familiar with exploits into the fantastic, Burroughs used framing-sequences as linking devices by which his characters were introduced to the bizarre. This film does the same thing. A stuttering awkwardly-uncertain Edgar Rice Burroughs himself is present, in the shape of actor Daryl Sabara. 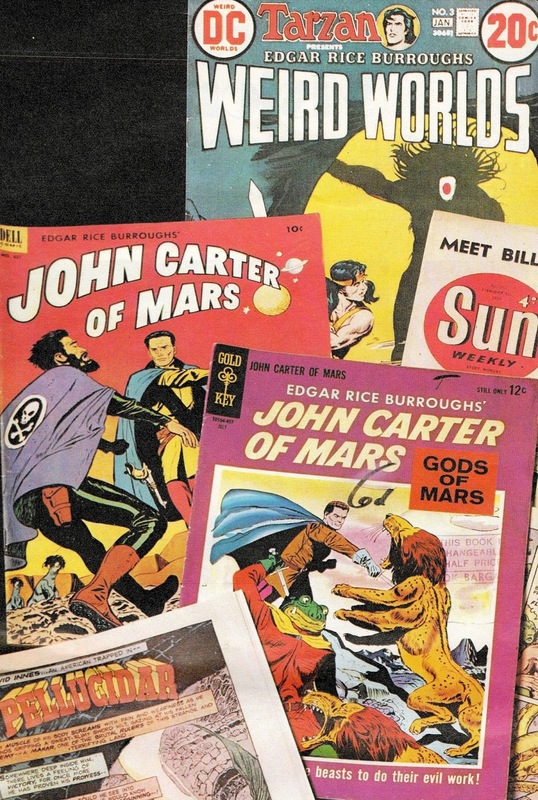 It’s he who investigates the ‘private journals’ of his late uncle, John Carter. Telling how in 1868, Carter is a Confederate misfit in post-Civil War Arizona, traumatised by loss and bereavement, attempting to make his way as a solitary gold prospector. Forcefully ‘invited’ to join the Seventh Cavalry in action against the Apache, he escapes and flees. Played on a short fuse by Taylor Kitsch this John Carter is a darkly truculent and largely inexpressive presence, although this is used to justify the tagline ‘Lost In Our World, Found In Another’. Seeking refuge in the inner recesses of a cave he stumbles upon a Thern medallion that instantaneously transports him into otherness. 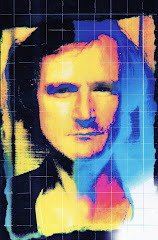 In the book his transition to Mars is achieved by a kind of astral projection, here ‘he’s telegraphed as a copy of himself’. It’s only later, through Dejah Thoris’ diagram of a nine-planet solar system scratched into Martian sand, that he learns he’s on Mars. 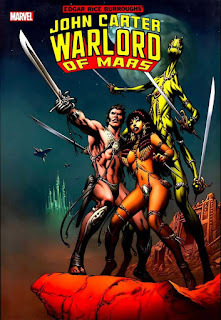 And the planet they call Barsoom is an ancient world of devolved races and hideous sciences. Its ‘time of oceans’ long-since passed. ‘Mars, so you name it’ drones the voice-over, ‘but you do not know Mars.’ With real-life expectations of finding organisms on the red planet receding to microbial life-forms… if that, Mars is fast-falling out of favour with film-makers. Hence dropping the ‘…Of Mars’ from the film title. The Tom Cruise remake of ‘War Of The Worlds’ (2005) even edits the alien’s Martian origins out of the plot entirely. Yet robot probes now trundling across the Martian surface indicate that there was indeed a billions-years-back time of shallow seas. And by making Carter’s interplanetary projection also a time-shift back a million years, an edge of credibility could have been retrieved. But maybe that’s to take it all too seriously. Despite the cult that’s grown up around his work, Burroughs was essentially a trashy storyteller who required only that his readers had ‘a youthful and elastic mind’, and this film continues in the tradition of outlandish yarns that he established. Carter falls into the barbaric green hands of savage Tharks, led by Tars Tarkus (Willem Dafoe), where his feats of superhuman agility and physical strength – enabled by the planet’s lesser gravity, earn him grudging respect. Due to an initial misunderstanding Tarkus calls him ‘Virginia’. The desolate desert Mars-scapes of ruined cities is an eye-ripping spectacle, impressively rendered as Carter rescues a fleeing Dejah Thoris (Lynn Collins) as her radium-powered ship comes under attack by a pursuing Zodangan warship under the control of her suitor Sab Than (Dominic West). She finds the lost Earthman’s tales of ocean-going ships as fantastic as he finds her ships that glide on light. 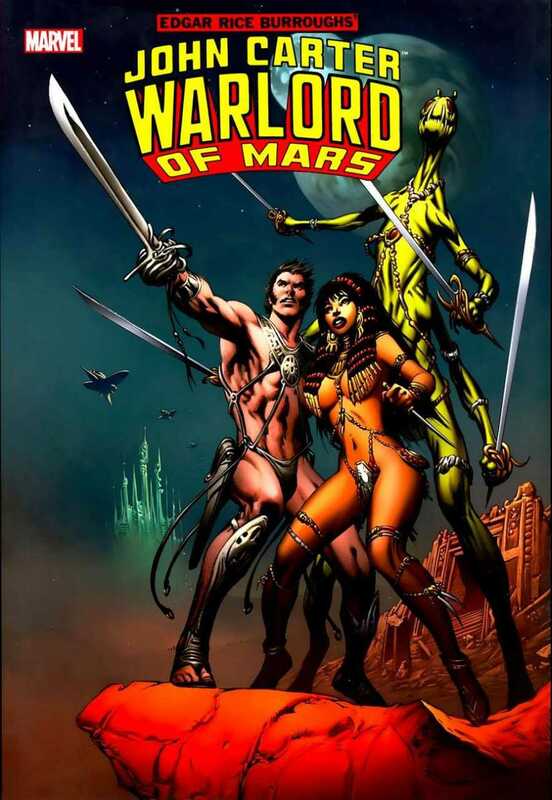 Warily, Carter and Dejah Thoris, with Sola (Samantha Morton) and his faithful Woola – more of a cute slobbery reptilian-dog here than in the novels, quest along the sacred river Iss to locate a way back home. Then, taken to Helium itself he’s assisted by a personable Kantos Kan (James Purefoy). And through the ensuing knuckle-gobbling adventures the previously dour Carter not only finds love, but rediscovers the sense of purpose he’d lost on Earth. He ‘finds his true home.’ The climax scene in which he’s sentenced to battle two four-armed Great White Apes in the arena alongside a deposed Tars Tarkus, had unfortunately been trailored by a similar sequence in ‘Star Wars: Attack Of The Clones’ (2002), but is sufficiently generic to stand in its own right. Victorious, he erupts up through the monster corpse drenched in the White Ape’s blue blood. To lead the Thark horde in a spectacular battle against treacherous Zodanga even as the fatal marriage commences. 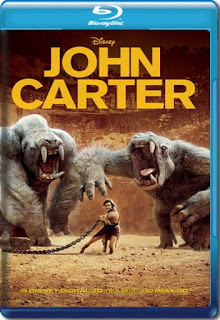 If ‘John Carter’ was intended to be the first of a movie-series, its poor box-office performance means this will not now happen. Despite the long-tail ongoing profits generated from Blu-ray/DVD-sales and endless small-screen reruns to come, in which it will surely be better-valued. That’s unfortunate because – as with the prematurely truncated ‘Narnia’ films, there are not only Barsoom books aplenty left to film, but a closing sequence of ‘A Princess Of Mars’ itself is excluded – relating to unlocking the atmosphere machine. Instead, the role of the controlling sapphire-eyed Therns is ramped up, explaining ‘we don’t cause the destruction of the world, Captain Carter, we simply manage it, feed off it, if you like.’ Their influence extending across the gulf of space to Earth, to where Carter is unwillingly returned. Carter then narrates how he becomes a kind of Indiana Jones scouring ancient sites of the world for evidence of all-powerful Thern intervention in terrestrial history. 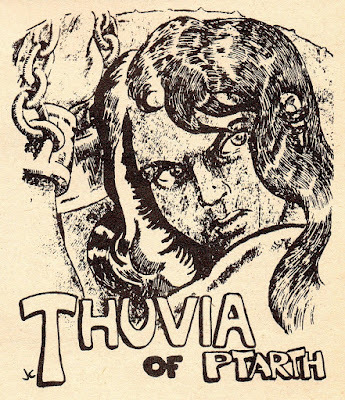 The framing-sequence resumes as ER ‘Ned’ Burroughs opens up his uncle’s Poe-like tomb, to find it empty, and his faked death a ruse intended to lure the shape-shifting Therns out of disguise, enabling him to return to Dejah Thoris and resume his role as Warlord of Helium. The inscription above his tomb – ‘Inter Mundos’, translates as ‘between worlds’. And before returning to Mars, John Carter instructs his nervous nephew to document the ‘most wondrous stories’ of his full transplanetary trip, bringing it all full-circle. The tale we are watching onscreen is taken from the text he subsequently wrote. One hundred years after he wrote it. So, this is a film one-hundred years in the making. And maybe that’s part of the problem…?